This entry was posted on Tuesday, December 4th, 2018 at 11:32 am. 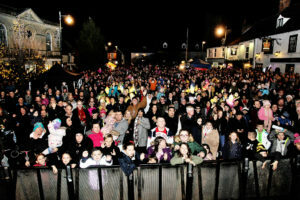 HUNDREDS turned out to see the switch-on of Westbury’s Christmas lights, with a few surprises thrown in along the way. It was another successful year for Westbury Town Council, who organised a jam-packed event for the annual Christmas lights switch-on. From market stalls to a fun-fair, an animated snow lion, a lights switch-on ‘malfunction’ (all planned of course) and Father Christmas rocking out to Queen – the spirit of Christmas is now truly alive in Westbury. All Saints Church also held its annual Christmas Tree Festival, where businesses were invited to decorate a tree, with the public voting for their favourite. The evening, compered by Leander Morales, welcomed performers such as PSG choir, Mollie Green, Frome Street Bandits and the Will Blake Band. The crowds were also treated to a surprise trumpet solo from Lydia from a high onlooking window and also a festive video, created by Leander, with local businesses wishing the town a Merry Christmas. The video also featured famous faces and faces from across the pond! It is available for you to watch on the Westbury Christmas Lights Facebook page. The lights switch-on was full of drama this year with a planned theatrical malfunction! An acted scene entertained the crowds where the town crier, John Hadfield, was first nominated to switch on the lights, causing a system ‘overload’! On stage then came the Christmas fairy, Radek Evans, who naughtily stole the mayor’s hat whilst everyone was in a freeze frame. Then Wheeler’s of Westbury came to the rescue, finding an unplugged wire. Once it was all fixed, the correct person to switch on the lights, Finley Lawson – the mayor’s Christmas card competition winner – pushed the button to illuminate the town. Local company, Xylobands, who are known for lighting up Coldplay’s concerts, supplied the town with light up wristbands for a small donation. The donation will go towards the mayor’s charity this year, which is the Westbury Community Project. With hog roasts, hot chestnuts, mince pies and mulled wine, the town of Westbury began its Christmas festivities. Mayor, cllr Ian Cunningham said, “It was absolutely fantastic! We had a wonderful crowd, the community of Westbury all came together and it was a wonderful feeling. “I want to say a huge thank you to all the staff of the town council who worked throughout the day and also the town councillors who helped out, a lot of effort was put in to achieve the event. “A particular thank you to Martin Dawson, events coordinator at the town council and Leander Morales of GM3 music , who both worked incredibly hard and I’m glad it all went to plan.